New models have reached the marketplace, but high initial prices keep applications limited. Building on the trend toward remote work, two companies started shipping wheeled telepresence robots to customers this year, and other versions are launching soon. While prices are steep and sales tepid, some early adopters find that the robots offer advantages over technologies such as videoconferencing. Telepresence robots are wheeled machines steered by a person sitting at a remote computer; the bots take the person’s place around the conference table or, say, on a facility inspection. They are equipped with cameras, microphones, screens, and speakers so the human controller can interact with real people. But using one of these robots is far harder than picking up a phone or using a video calling system. I tried one this year (see [the 2:37 minute] video), to stand in for me at Technology Review‘s main office in Cambridge, Massachusetts, as I worked in San Francisco, and encountered a fairly steep learning curve. Piloting a robot, and contending with its sometimes poor hearing and limited vision, can make interacting with people a challenge. Still, customers find them valuable, says Ned Semonite, VP for product management at VGo Communications, the New Hampshire-based company that sells the four-foot-tall robot I tried. Some engineers and designers enjoy being able to visit a distant lab or inspect a prototype without leaving the office, he says: “It means they can be there more often. You get the immediacy of walking in the door, and that valuable ad hoc contact.” More than 200 of the robots are in use so far, he says, and customers include companies such as Hewlett-Packard and Cisco. Telepresence robots are a better bet now that that reliable Wi-Fi access has become standard in the workplace. And the 4G cellular data networks being rolled out by carriers will make them even more capable, says Semonite, whose company has been working with Verizon on a version with a built-in 4G connection. “It will make it possible for the robot to work reliably right out of the box, and to go into places like factories or warehouses that don’t always have Wi-Fi,” he says. 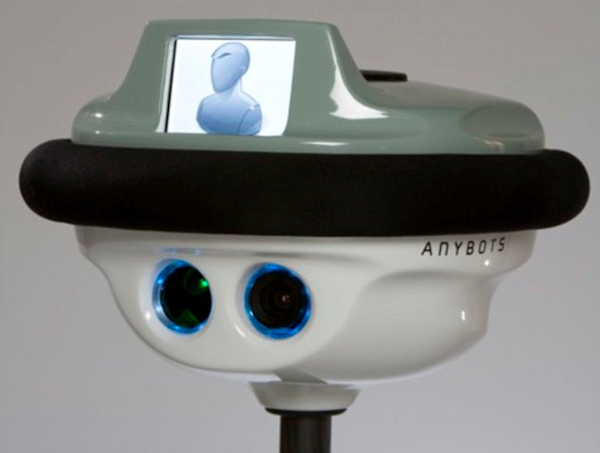 It’s not yet clear whether telepresence robots are cost-effective, however. Semonite claims that the $6,000 Vgo can pay for itself just by saving the need for a few business trips. The only competing robot on the market, the much taller QB from the California startup Anybots, might need to replace a few more trips to justify its $15,000 price tag. Yet both robots compare favorably with dedicated videoconferencing rooms, which are sold using similar arguments and cost hundreds of thousands of dollars. Tom Serani, cofounder of RatePoint, which helps businesses monitor their online reputation, says that his Vgo paid for itself in about a month by allowing managers to maintain a presence among call-center staffers. He says that this remote managerial presence helped spur a 30 percent increase in sales. Other companies are preparing to launch telepresence robots aimed at addressing what Colin Angle, cofounder and CEO of iRobot, says is a need for significantly more intelligence. For example, instead of having to steer a robot like a remote-controlled car, he says, a user should be able to ask it to navigate to a particular meeting room, or click on screen to indicate which person to follow or walk alongside. “The products that have launched so far are really videoconferencing on a remote, driveable platform,” says Angle. “It has some appeal, but they don’t build a version of you in a remote location able to be as effective as you would in person.” His company, which makes the Roomba vacuum cleaner and the military PackBot, is working on a version, dubbed Ava, that he says will solve some of these problems.